Webwise.ie / Parents / Get informed / Explainer: What is Tagged.com? Tagged.com is a free-to-use online dating service where users can meet new people and talk online. Initially the service was set up for users under 18 and was a popular meeting site for teens. However, following criticism and reports of inappropriate content, the terms of service now state users must be over 18 to register for the site, since February 2014. Users of the under 18 service were kept separate to over 18’s similar to Tinder for Teens, in addition users who were aged 13-14 could not be viewed by any one over 16. However, the site now requires all users to be 18+. Users can sign-up using their Facebook, Google account or via email. If you sign-up from Facebook, the service will use your date of birth from your Facebook account to verify your age. However if you sign-up with email, you simply insert your date of birth making it relatively easy for under 18’s to sign-up. 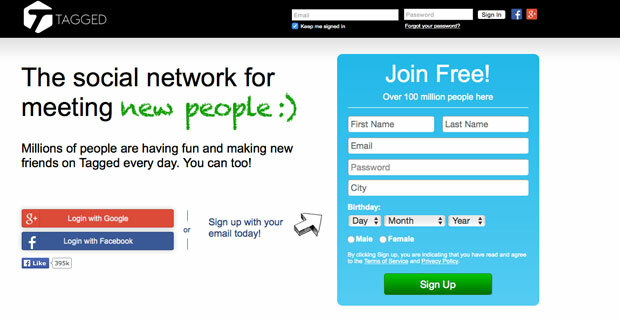 Users like Tagged.com as it is a free, easy-to-use social network that allows users to meet and talk to new people online. The games functions are also popular with games including the ‘Pets’ game. According to Tagged.com; “The Pets game is a unique feature that allows you to ‘own’, ‘buy’ and ‘sell’ other members like a fantasy team. You can compete with all your Friends to see who can gain the highest value or just buy and sell Pets as you meet cool new people in the game!” Please note in-app purchases are also available, users can purchase app currency for games and also gain additional functionality within the app – for example to see who viewed your profile. Users create profiles similar to how they do on other social media services, using their email address, Facebook account or Google account. Once you have created a profile you can add photos, share videos, make friends and join groups. The site itself makes it very easy for users to make new friends. There is also a browse function which allows you to chat to other users even if you are not friends. Users simply click on the send message button to contact other users. Similar to other dating apps/services, Tagged.com allows you to meet people by age, location interest and more. In addition to these chat functions, there is also a Meet Me section on the site which is very similar to the online dating app, Tinder. Users can flick through possible matches, view profiles and like profiles. If another user likes you back, then you are alerted to the match. As with all social networking sites there are risks users should be aware of. When a user sets up an account with Tagged.com privacy settings are public by default. This means all information provided in your public profile can be viewed by anyone with an account, further to this anyone with an account can message or contact you. Users should always review privacy settings when opening a new social network. Users may want to consider switching settings to a friends only option to help prevent an unwanted contact. 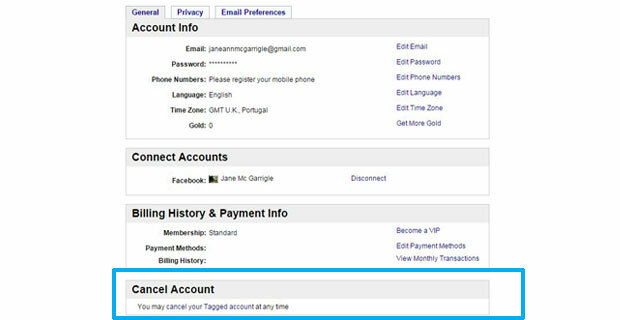 Users should also be aware that even if you sign-up from Facebook and have a friends only option in your Facebook account settings, this does not mean your Tagged.com account is private. 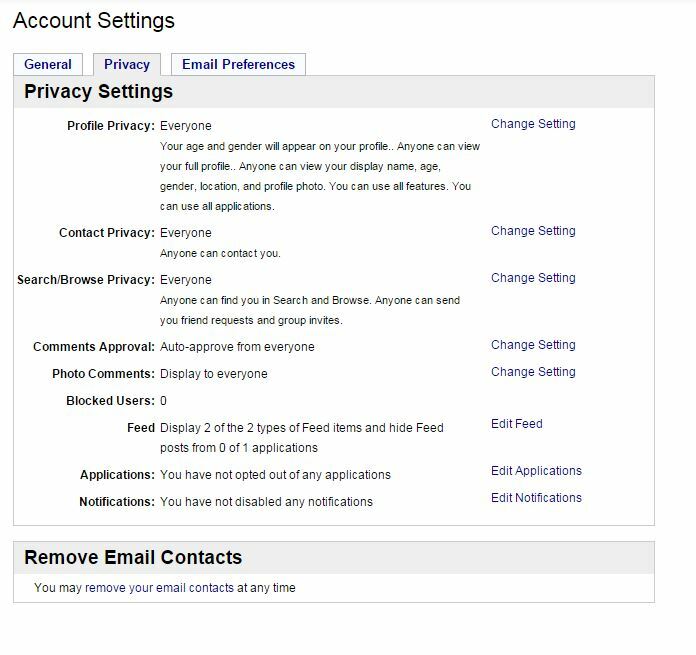 Update your privacy settings via the Tagged.com account settings. For more info on privacy go to: tagged.com/terms_of_service. Tagged.com’s main features are aimed at meeting and chatting to new people. Users should be careful with whom they talk. With any chat room or social network, users should be aware that some people may not be who they say they are. The site has been mentioned in a number of cases involving online predators and minors, in the U.S. and in Ireland, more recently. What to do if my Teen is on Tagged.com? Tagged.com is for users who are 18 and over. We do not recommend this site for teens or any one under 18. If you are worried, ask your child if he/she is signed up to the site. 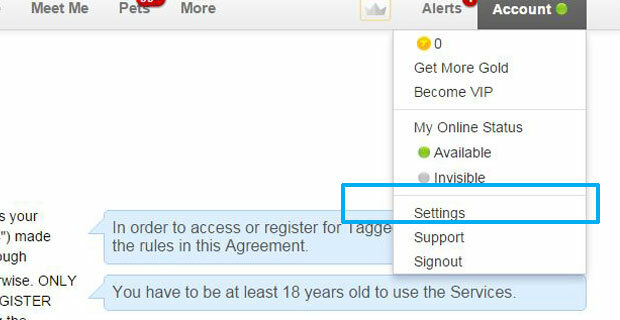 STEP 2: Click ‘cancel your Tagged account’ under the general settings section. 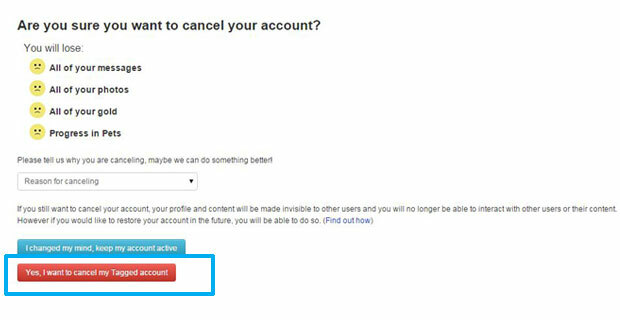 STEP 3: Click ‘yes, I want to cancel my Tagged account’.